I didn’t intend talking about this, I’ve mentioned it before. I intended talking about something else, but since this is an integral part of that something else, I’ll talk about that another time. The best tool for utilising microformats, is the Operator add-on. Other people have tried creating tools for other browsers, but for minimal pain and quick results the Firefox/Operator combo is still the best. After installing the add-on you will notice a new toolbar. Many web pages fail to take advantage of microformats, so to save browser real-estate you can autohide the toolbar by clicking the Options button and checking the Auto-hide-the toolbar option, clever. To see what it can do; Go to Edge Hill University’s events. If you auto-hid the toolbar, it should magically appear, and if you didn’t you should see Contents, Events, Locations and Tagspaces all lit up. That tells us we’ve got microformats on the page, and this is where Operator earns its corn; Clicking on one of the highlighted icons, we can see a number of services on offer. 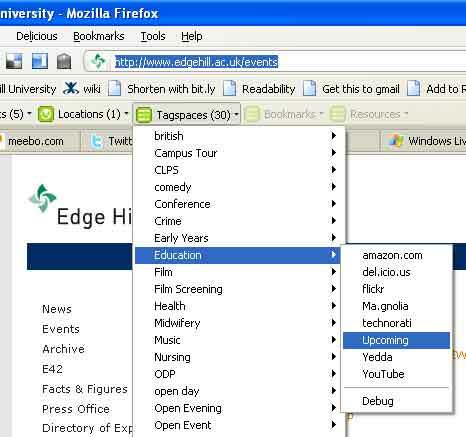 Click the Tagspaces button, navigate to Education->Upcoming. This takes you to Yahoo’s Upcoming site, and shows a list of similarly tagged events. Nursing->YouTube lists videos related to Nursing. The Edge Hill Events page also picks up a single location (Edge Hill University, which it gets from the information at the foot of every page) and dispays it under the Locations button. We should really add the location data to each of the listed events too (note to self). By clicking the button, we can see the exact location of Edge Hill through Google Maps (best), Yahoo maps and MapQuest. You could export to a KML file to import into Google Earth too. The Events button will show each event and allow us to add it to any iCal supported application. Groupwise has a problem with this but if you use Google Calendar or Yahoo it will pre-populate a “new event” screen ready for submission. If you don’t know what 30Boxes is, give it a try, its a very slick web-based calendar, I still prefer Google’s though. Contacts->Export All or Contacts->Edge Hill University->Export Contact. Double click the exported hcard file and select the Contacts list you prefer to use. Click the bookmarklet when Contacts on the Operator toolbar is highlighted. From the Google Mail Contacts page, click import and import the downloaded file. The import to Yahoo contacts works like a dream though. For anybody who is determined to stick with IE and Safari users, you might want to try Left Logic’s bookmarklet, although I’ve not tested it in either of those browsers myself. Finally if you’d like to add microformatted contact details on your own site, you can create the code easily using the hCard creator.